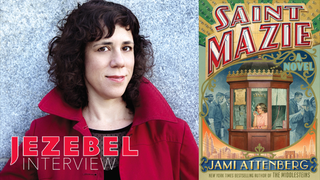 Saint Mazie, the wonderful new novel released this week by Jami Attenberg, tells the story of Mazie Phillips—a nearly forgotten New York City legend who, in the early 20th century, improved the lives of the city’s homeless when no one else seemed to care. For more than 65 years, Mazie, a platinum blonde with a husky voice, passed out advice (“Go take a bath, you bum”), money (“That’s a real quarter now”) and sympathy (“You got the makins of a great man”) to every Bowery derelict who would pause to listen...from be­hind a cashier’s cage at a thea­ter on Park Row. She was known and liked in the Bowery and yesterday...there were men sit­ting on doorsteps, ignoring their tattered clothes and other dis­comforts and lamenting her death. Some drank to her mem­ory, he added, as she had often done for others. Though Phillips actually existed, Attenberg’s book is fiction—a sparkling narrative that takes what little we know about the actual woman and turns her into a literary giant more than worthy of her real life nickname: The Queen of the Bowery. Attenberg and I spoke about Mazie, the woman and the character, over email. My friend John McCormick is a restaurateur in Brooklyn, and—this was maybe fall of 2011—I was at his house and he started telling me about a new bar he was going to open called St. Mazie. And then he explained the significance of the name to me, that he’d read about this wonderful woman named Mazie Phillips in Joseph Mitchell’s essay collection Up in the Old Hotel, and how she’d devoted her life to helping the bums on the streets of New York for decades, and that she sounded like the closest thing to a saint he’d ever heard of. The next day I read the essay, and she felt instantly like both a feminist and an American hero to me. And I did a little research on her and found out that she’d planned on writing her memoirs but never did. And I immediately, desperately wanted to read those memoirs. So I decided to write them instead. I wanted to know about her, but also I wanted everyone else to know about her, too. It was just over a few days this all happened, although it took me probably about six more months to actually start it, because I was in the process of finishing another book, which I eventually threw away. Now the bar is open and thriving, and the book is done. In the book, old friends and acquaintances of Mazie discuss her in the present day. Did you have the chance to communicate with people who knew her? Well she died 50 years ago last summer, so there’s not a ton of people floating around that knew her. I did get to talk to one man who knew Mazie, but this was well after I had written the book. He told me a few things about her that I never knew, but the main joy of the conversation was having him confirm that she was truly as great a person as she appeared to be. Where did you write the bulk of the book? I split the writing of the book between New York City, where I live most of the year, and New Orleans, where I spend my winters. I was glad to be in NYC for some of it, because I had the chance to walk the same streets as she did and visit some of the same locations where she used to live and spend time. But I wrote the final third in New Orleans in a frenzy last year, and solidly revised the book there as well. I find my mind works differently down there; it’s a bit more free and poetic. The book gives the reader such a rich and wonderful image of New York in the early 20th century. Did so familiar with “old” New York changed your perception of its present? I’ve lived in New York City since 1998, and first visited here in 1989 to go to a show at CBGBs, so I have seen it be a much rougher place. The Bowery in 1989 certainly felt more like the Bowery in my book, as opposed to the Bowery we have now. But I think what I learned most from writing Saint Mazie is that this city is destined to repeat itself. In my research I saw all these cycles of the city building and destroying and rebuilding again, moving around the impoverished as if they were checker pieces, and not human beings. But also I found examples of the people of this city coming together to care for each other in extreme and beautiful ways. And I still see all of that now, and there are certainly patterns of it in every decade of the last hundred years, give or take. We are doomed to build and destroy. I love when Mazie responds to something by saying, simply, “Scram.” How did you familiarize yourself with the language and vocabulary of the time? The source text was quite helpful, and not just the original essay about Mazie, but the entire collection of Up in the Old Hotel. I watched a few movies, including this wonderful documentary, “On the Bowery.” It’s sort of half documentary, half fiction, about bums in New York City, and it takes place a bit later, in the 1950s, but there were bits and pieces of the way those guys talked that were helpful to me. I found myself writing down words here and there that I liked, that I thought Mazie would use, and I would just pluck one from the list whenever I wanted to spice up the scene, remind the reader of where they were. I didn’t want to overdo it though! I didn’t want it to sound too old-timey. Because in real life our vocabulary is always a mix of slang and standard English. At one point Mazie says she wants “instant love,” and that got me thinking of your first novel. When you look back on the path your career as a novelist has taken, does it look like the one you imagined it would be after finishing Instant Love? I always leave little Easter eggs in my books, little references from other books I’ve written, so I’m glad you found that one! About three people read that book so I wouldn’t presume that anyone would recognize the name. I don’t know if I had any idea of what a writing career could look like in 2006. I was still working in advertising when Instant Love came out, and I did so for another six years. I was hoping I wouldn’t have to do it forever, but based on the reception of Instant Love and the two books that followed, it seemed like I might, and I would just write on the side. My sister-in-law works in publishing and early on she told me, “You need to go into this with the attitude that you will never make a living off it. Writing a book can open doors for you though.” So I was always thinking very strategically about what a book could do for me in small ways, that there might be an accrual of successes that would lead to something else. It’s rare for just one book to change someone’s life in a significant way. I think instead it’s about creating a body of work over 10 or 20 years, and seeing what comes out of that. Can you explain the internal struggles you had while fictionalizing elements of a life that has actually been lived? Oh I just loved Mazie so much that I hoped I would do right by her! At a certain point I hoped she’d understand that while it was completely fiction, I tried my damndest to tap into her essence. I think the hardest part is that she was just such a genuinely great person and I’m like, an OK person? Like I’m not terrible, but I’m not a saint. So I had to imagine what a great person would do in certain situations. I would have to pretend I was nicer than I actually am. Of course, she was also deeply flawed, self-indulgent, extremely boozy, and had quite a mouth on her. Those parts were easier for me to write. What would you say to Mazie if you could hand her a copy of the novel right now? The thing that keeps rattling around in my brain lately is even though I never met her, how proud I was to know her anyway. Image via Jami Attenberg/Grand Central Publishing.